What a week for Brian Alfred, Hull Kingston Rovers and the new #BAFanZone hash tag. It all started with the #BAFanZone Twitter Takeover, where fans took part in a Q&A with Rovers centre Iain Thornley on Monday (you can follow him on Twitter @iainthornley1). Naturally, he concluded the week with a memorable try against Warrington Wolves at the KC Lightstream Stadium. 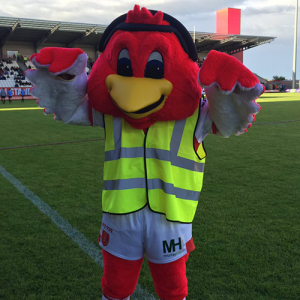 Brian Alfred invited Rovers fans to use our social media channels and the Hashtag #BAFanZone to share their best Hull KR “shirt selfies”. Our official winner was Mel Scott, who shared selfies in both home and away jerseys – for those efforts she earned two free tickets to Friday’s match. But that wasn’t it for competitions. No, we went all out, asking the #BAFanZone Twitter following for guesses on whom the first Hull KR try scorer would be in Friday’s match. Those who selected Hull KR’s James Donaldson were smiling, none more than Erin Smithson, who won a signed shirt from try scorer Donno himself. Brian Alfred can even claim that they had a hand in every try, even though Donno ended up Man of the Match (we’ll get over it). Kidding aside, our official Try signage was another hit from the #BAFanZone effort last week. Even Rufus got in on the fun. Then there was the match itself, beginning with a sombre and well-observed tribute to the 100th anniversary of the Battle of the Somme, and featured a back-and-forth battle with Wolves, now available through Hull KR TV.